What is the BowelScreen home test kit? How is the BowelScreen home test done? I have received a BowelScreen home test kit, what should I do? What is the size of the sample needed? I am due to do BowelScreen home test. I have constipation or diarrhoea – what will I do? My BowelScreen home test kit is lost or damaged or out of date, what do I do? How often will I be expected to do the BowelScreen home test? The BowelScreen home test kit is a simple test that looks in your bowel motion (also called a stool) for tiny amounts of blood which are not visible to the eye. The BowelScreen home test is a faecal immunochemical test also known as a FIT test. You do the test in your own home. The programme will send you a letter asking you to take part in the bowel screening programme. When you get a letter and you want to take part, call us on Freephone 1800 45 45 55. A BowelScreen home test kit will then be sent to you in the post with simple instructions how to do the test. You will need to produce a bowel motion and collect a sample on a sampling stick provided in your BowelScreen home test kit. There is no need to be embarrassed. It will only take one visit to the toilet. It is quick, easy and painless. 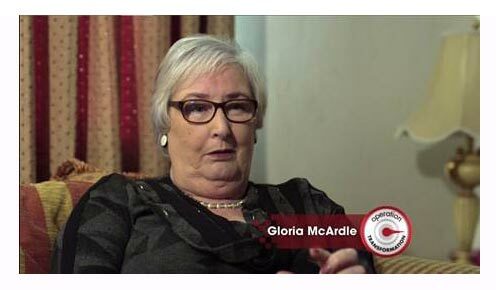 Gloria McArdle describes just how simple it is to use the free home test on the TV show, Operation Transformation. 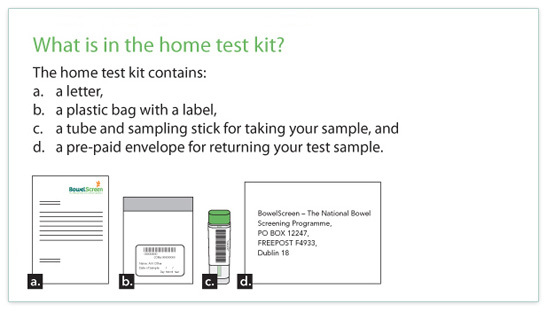 Check your home test kit has all the contents (see list below). Please read the instructions carefully before you do the home test. To do the home test you will need to produce a bowel motion. A small sample is all that is needed. Please ensure that you write the date when the sample was taken on the label on the plastic bag as this is very important for ensuring that the result can be issued. If you have any problems doing the home test or need some more information, call Freephone 1800 45 45 55. Please check that you have put the date on the label on the plastic bag. It is free to post the sample in the envelope provided, there is no cost for postage as it is a 'Freepost' address. Once you have sent back your sample, a letter will be sent to you with the results of your test in four weeks. A small sample of your bowel motion is all that is needed. There is no need to provide a large sample of bowel motion. Collect a small sample of your bowel motion, just enough to coat the end of the sampling stick, by scraping the sampling stick on your bowel motion (stool) until the end of the stick is completely covered. If you have received your BowelScreen home test and it is possible for you to do this, please do so, or wait until it is comfortable to do so. However if the symptoms are prolonged (lasting for four weeks or more), you should see your GP. My BowelScreen home test kit is lost or damaged or out of date? Please contact the programme on Freephone 1800 45 45 55 and a new BowelScreen home test kit will be sent to you. Like all screening tests, bowel screening is not 100 per cent reliable. The test only looks for blood in your stool and not all cancers or polyps bleed all the time. Changes can also happen between screening tests. This is why it is so important to have the screening test every two years and to see your GP (family doctor) if you have any concerns or symptoms at any time. If your results are normal you will be re-called every two years, if you remain in the age range 60-69.